The Global Educator: My Life in Qatar: A Tall Spike in an Unflat World? My Life in Qatar: A Tall Spike in an Unflat World? This is my third blog post as the guest of the week so I thought it was time I introduced myself a little more and talked about where I currently live and work. As you can tell by my accent, I am from Melbourne, Australia but have been working and traveling as an international educator for over 10 years, along with my husband (mathematics teacher) and daughter (just hit the terrible teen years!). Places I have worked are Zambia, Kuwait, Bangladesh and now Qatar. Being our first year in Qatar we are finding our new school, Qatar Academy, challenging in many ways. However I am finding my new position as Head of Information Technology and E-Learning to be a wonderfully rewarding experience with lots of amazing opportunities to contribute to the growth of the school. I am also responding to Scott's post earlier today, The World is Spiky, where he shares some interesting insights from Richard Florida's new book Who's your city. From reading the words of Florida I think Qatar is in fact a 'tall spike' in an unflat world. Definition of this: "the tallest spikes that attract global talent, generate knowledge, and produce the lion's share of global innovation." Here in Qatar I work at Qatar Academy, a PreK-12 school now delivering the IBO curriculum across all levels (PYP, MYP and DP) which is located on Education City, large campus on the outskirts of Doha. However I work for Qatar Foundation (QF) for Education, Science and Community Development. QF represents the innovation and creativity of His Highness Sheikh Hamad Bin Khalifa Al Thani, Emir of the State of Qatar. QF is a non-profit organisation and was founded in 1995, and Education City is their flagship. And many are now considering full-fledged foreign branch campuses, particularly in the oil-rich Middle East. Already, students in the Persian Gulf state of Qatar can attend an American university without the expense, culture shock or post-9/11 vis problems of traveling to America. At Education City in Doha, Qatar’s capital, they can study medicine at Weill Medical College of Cornell University, international affairs at Georgetown, computer science and business at Carnegie Mellon, fine arts at Virginia Commonwealth, engineering at Texas A&M, and soon, journalism at Northwestern. Education City, the largest enclave of American universities overseas, has fast become the elite of Qatari education, a sort of local Ivy League. But the five American schools have started small, with only about 300 slots among them for next year’s entering classes. 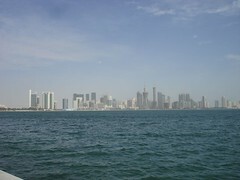 In Doha, since I was last there, a skyline that looks like a mini-Manhattan has sprouted from the desert. Whatever construction cranes are not in China must be in Doha today. This once sleepy harbor now has a profile of skyscrapers, thanks to a huge injection of oil and gas revenues. Then there are the other Qatari government initiatives in education from ICT Qatar that include e-Education and the e-Schoolbag program amongst other programs. I visited the new boys school rolling out the e-Schoolbag Tablet PC implementation and was duly impressed. There are many international consultants and educators currently working in Qatar, advising the government and supporting the vision with extra expertise and knowledge. Qatar is determined to be a 'knowledge society' and with that vision in mind are carefully planning their approach to education. Yes, this is the Middle East and there are certain cultural sensitivities (aren't there any where in the world?) however I am finding a certain liberal attitude and a genuine desire to move forward. At a recent parent-teacher conference (Qatar Academy has about 85% Arabic students) I was pleasantly surprised at the friendly parents who not only wanted to shake my hand (remember that it is not always acceptable for men to shake a woman's hand here) but also called me by my first name. So what does this all mean for the rest of the world?......well I suggest you all keep a close eye on Qatar. This is not a flash in the pan, this is a carefully calculated and planned development that is already making waves and impacting around the world. We have Al Jazeera news, we have Doha Debates, we had the Asian games 2006 and we are bidding for the Olympics for 2016. We have a clean city (I have just been to Mumbai and was brought back to the reality of a large, dirty city..what does Florida call them? 'third-world megacities'), albeit a little sandy some days. Qatar really is a 'tall spike in an unflat world' and despite the environmental concerns caused by over-indulgence (thanks Tom for reminding us), it is a beehive for creativity, innovation and 21st century thinking. "Today we plant seeds, tomorrow we open frontiers, tomorrow is rooted here".